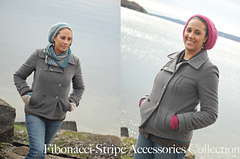 This e-book comprises the Fibonacci-Stripe Accessory collection, which includes the slouchy tam, a set of convertible mittens with an optional texter-thumb (pattern includes options for traditional mittens as well), and a close-fitting neck-warmer with button closure or a long cowl that can be worn open or doubled. Each pattern includes instruction for both the two-color Fibonacci-Stripe pattern, or the one-color Texture-Stripe variation. The Slouchy Hat pattern includes two sizes and two different depths. It is worked in the round, and uses “bulls-eye” decreases to accentuate the Fibonacci striping. The Cowl/Neck-Warmer pattern includes instructions for the shorter and longer versions. The Neck-Warmer uses six 5/8” buttons (but could be knit in the round without buttons if you prefer). The Cowl is knit in the round. Finished sizes for the both pieces are after blocking. The Convertible Mitten pattern includes two sizes, with instructions for flip tops or traditional mittens, and an optional “texter-thumbs”. It is easily adjustable for length (great for tall knitters! ), and the extra-long cuffs keep the wind out of coat sleeves. The flaps are worked as a continuation of the mitten, in one piece with short-row shaping, and they lay flat against the back of the hand when not in use. No buttons necessary! The pattern can be easily adjusted to make traditional hand-warmers as well. two-color striped version: 6 balls of Blackstone Tweed; three in 2602 (MC), three in 2646 (CC). one-color texture-striped version: 5 balls of Blackstone Tweed; three in 2602 (MC), two in 2646 (CC).